economic growth and the diffusion of knowledge have allowed us to avoid inequalities on the apocalyptic scale predicted by Karl Marx. But we have not modified the deep structures of capital and inequality as much as we thought in the optimistic decades following World War II. The main driver of inequality--the tendency of returns on capital to exceed the rate of economic growth--today threatens to generate extreme inequalities that stir discontent and undermine democratic values. But economic trends are not acts of God. 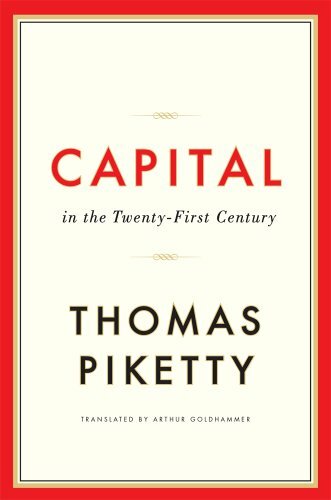 Political action has curbed dangerous inequalities in the past, Piketty says, and may do so again.A work of extraordinary ambition, originality, and rigor, Capital in the Twenty-First Century reorients our understanding of economic history and confronts us with sobering lessons for today. Thomas Piketty was born in Clichy, France on May 7, 1971. He received a M.Sc. in mathematics at Ecole Normale Supï¿½rieure and a PhD in Economics at EHESS and at LSE. He is a professor at the Paris School of Economics. His articles have appeared in numerous journals including the Quarterly Journal of Economics, the Journal of Political Economy, the American Economic Review, and the Review of Economic Studies. He has written several books including Capital in the Twenty-First Century. Arthur Goldhammer is the translator for numerous books including Neoconservatism: The Biography of a Movement, Algerian Chronicles, The Society of Equals, and Capital in the Twenty-First Century. He received the French-American Translation Prize in 1990 for his translation of A Critical Dictionary of the French Revolution.